The first formula most encounter to find the area of a triangle is A = 1⁄2bh. To use this formula, you need the measure of just one side of the triangle plus the altitude of the triangle (perpendicular to the base) drawn from that side. The triangle below has an area of A = 1⁄2(6)(4) = 12 square units. 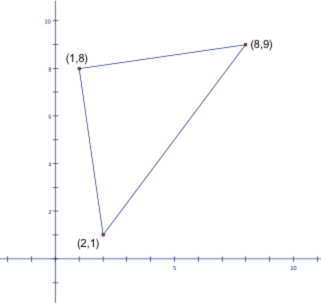 Now, consider a triangle that’s graphed in the coordinate plane. You can always use the distance formula, find the lengths of the three sides, and then apply Heron’s formula. But there’s an even better choice, based on the determinant of a matrix. Here’s a formula to use, based on the counterclockwise entry of the coordinates of the vertices of the triangle (x1, y1), (x2, y2), (x3, y3) or (2, 1), (8, 9), (1, 8): A = (x1y2 + x2y3 + x3y1 – x1y3 – x2y1 – x3y2)/2. Starting with the point (2, 1) and moving counterclockwise, A = (2(9) + 8(8) + 1(1) – 2(8) – 8(1) – 1(9))/2 = (18 + 64+ 1 – 16 – 8 – 9 )/2= (83 – 33)/2 = 25. The area of the triangle is 25 square units.